Ailsby Collection: Danzig Cross - First Class. Known Makers - B.v.A. Hulse - Berlin. 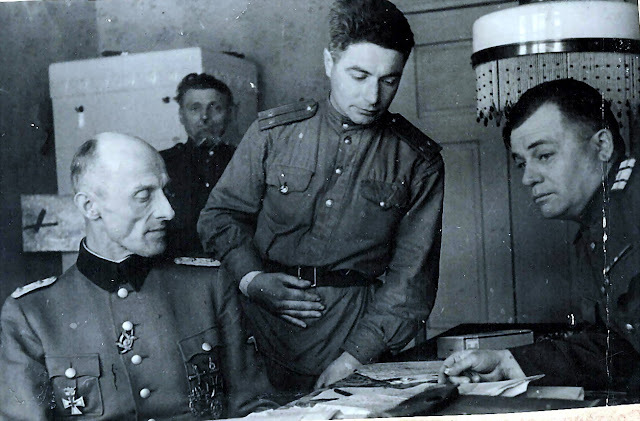 Just prior to the annexation of Danzig, Albert Forster, decreed the institution of the Danzig Cross on 31st August 1939. Two grades of the award were authorised, namely the First and Second Class. The award was, it was stated, "For meritorious service in the building up of the Nazi Party, within the free state of Danzig". 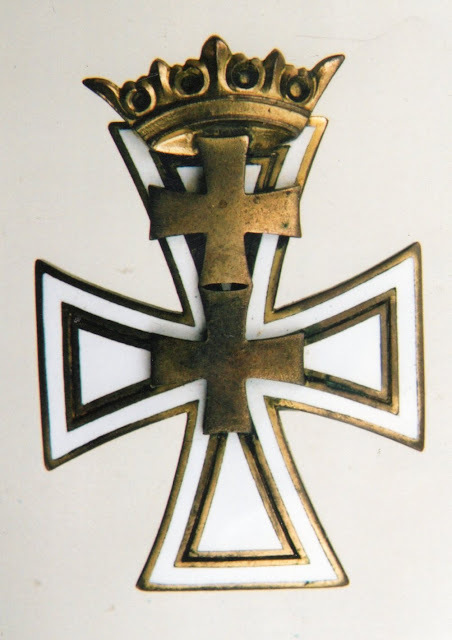 The First Class award is a pin back, enamelled cross measuring 44 mm wide by 60 mm high. 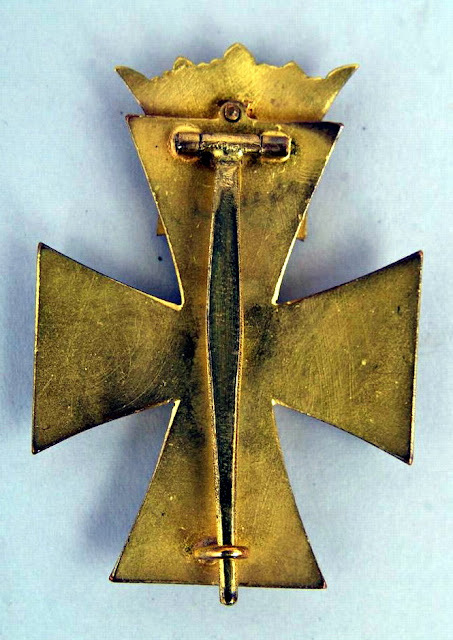 The form of the Cross is convex, and it is in white enamel, with a gilt outline to the Cross facing. 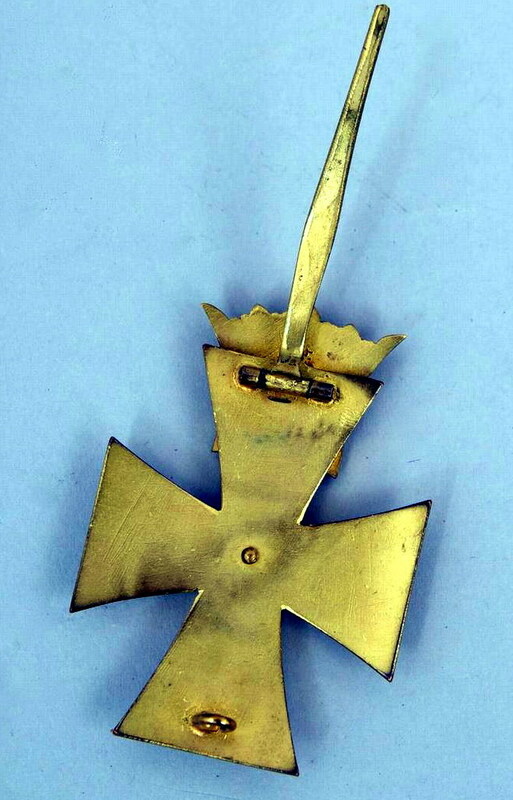 Mounted on to the face of the Cross is the coronet of Danzig surmounting the twin crosses of the free state, all are in gilt. 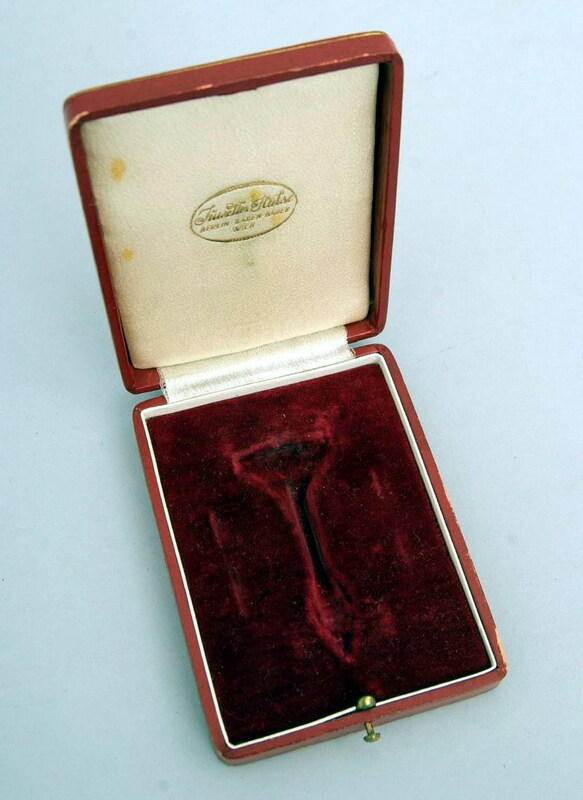 The back of the Cross is plain, save for the manufacturer's mark, B.v.A. 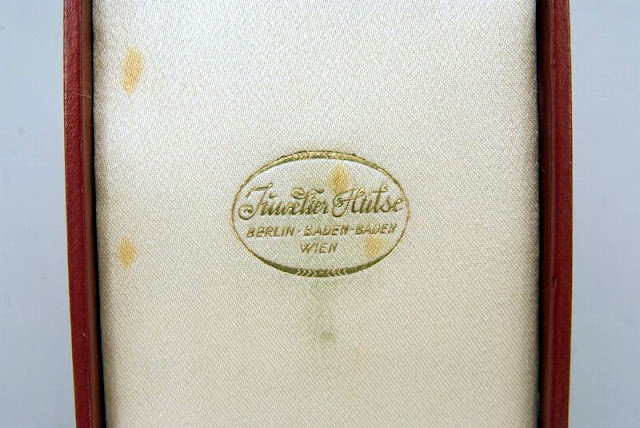 Hulse - Berlin. 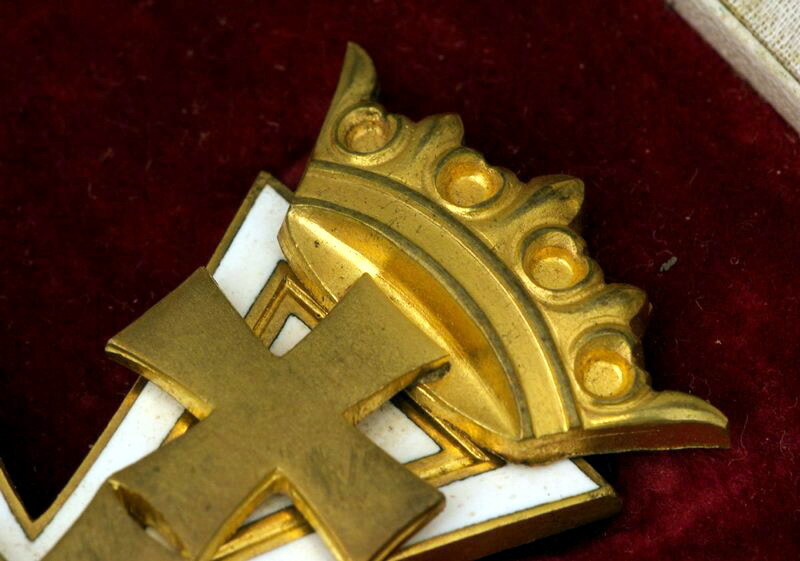 The mark requires a little further explanation, as it is in fact the mark of the designer SS- Oberführer Prof Benno von Arent, who was on the Stab RF SS, which was represented by the initials and the manufacturer. 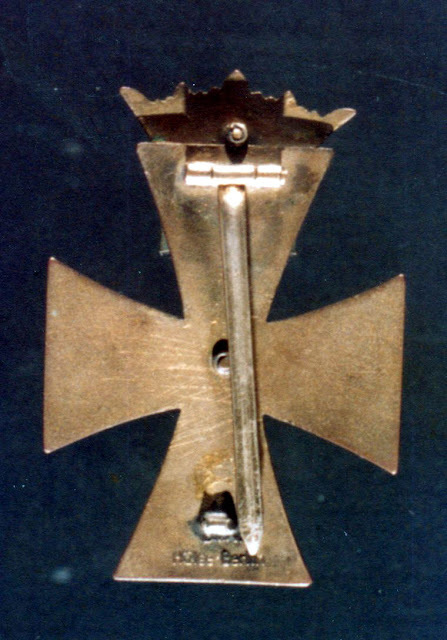 The leading edge of the upper arm of the Cross has a small eyelet, through which a rivet protrudes from the reverse of the coronet. This rivet has a circular washer, which is riveted over, and retains the coronet to the upper part of the arm. 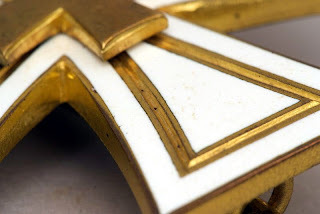 The centre or apex of the four arms that produce the Cross is also drilled, to allow a similar rivet from the reverse of the centre of the lower cross of the arms of Danzig, to protrude through the body of the white enamelled Cross. 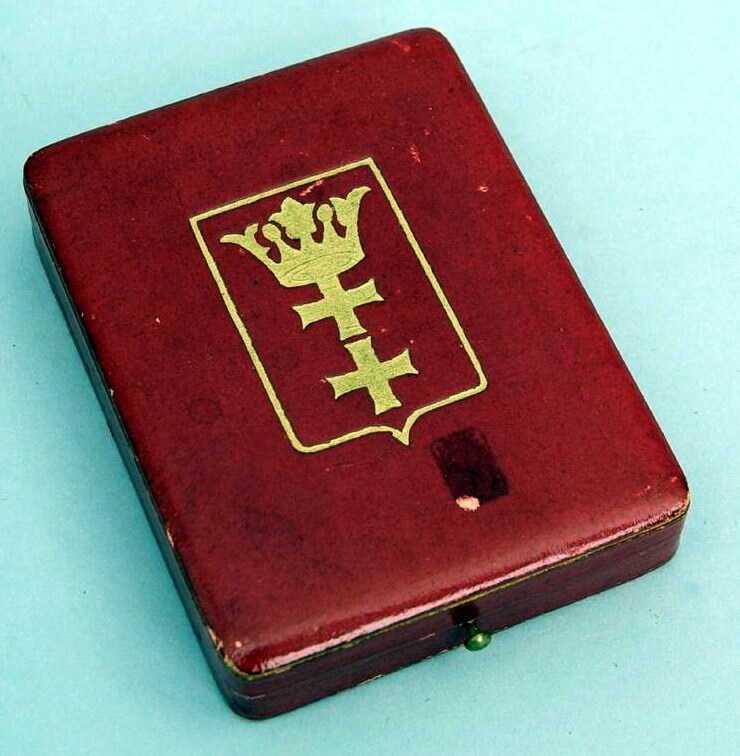 This is retained in a similar manner as to the rivet behind the coronet. 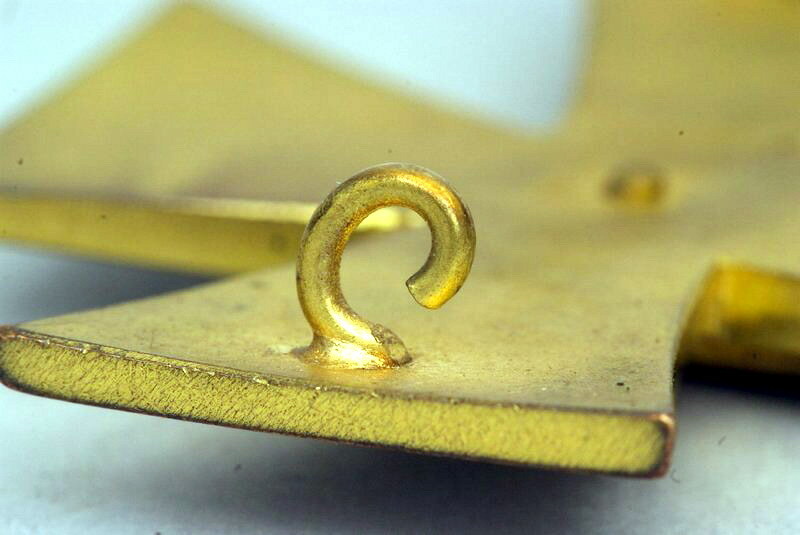 Approximately 3 mm beneath the eyelet at the upper arm of the Cross is the body of a hinge that retains the hinge pin. This is constructed in what is commonly known as the barrel hinge type, mounted on a small square box. 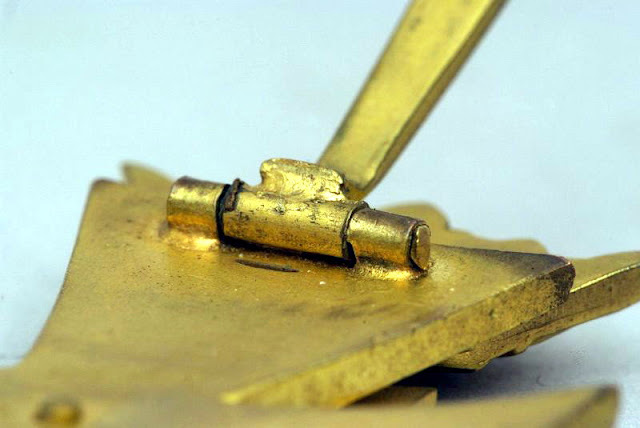 The pin is attached to the central pivot of the barrel and is approximately 3 mm wide by 2 mm thick and it is 43 mm long. It is a continuous piece of metal, which is attached and turned over at the hinge giving it the impression of a walking stick shape. The catch at the base, which is usually placed just above the maker's logo, is 1 mm thick, round wire that is soldered directly on to the back of the Cross. The First Class Cross is an extremely rare decoration. A total of only 88 awards were made, the majority of which were conferred on 24th October 1939, the major presentation date decreed since the inception of the award two months previously. 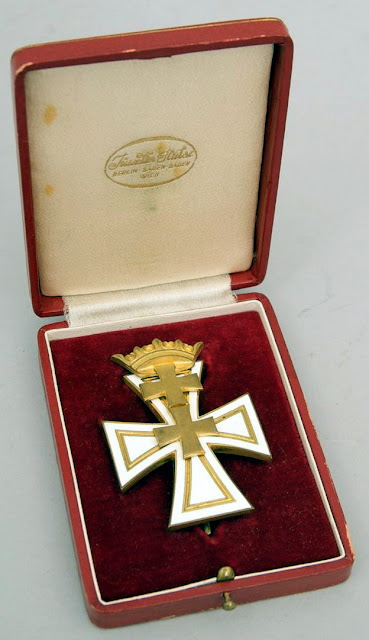 It is not known if it was a requisite that the Danzig Cross – Second Class had to be awarded before the First Class could be conferred. 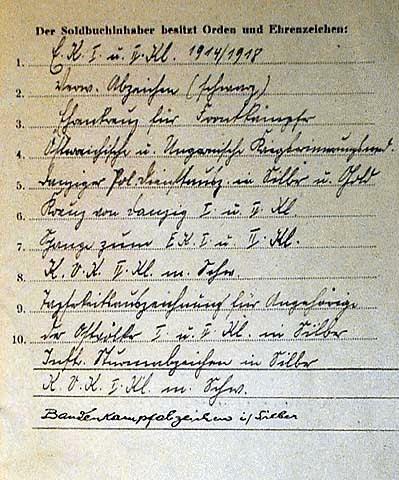 In the case of SS - Oberführer und Oberst der Schutzpolizei Hans Griep his file shows that he was awarded both classes. 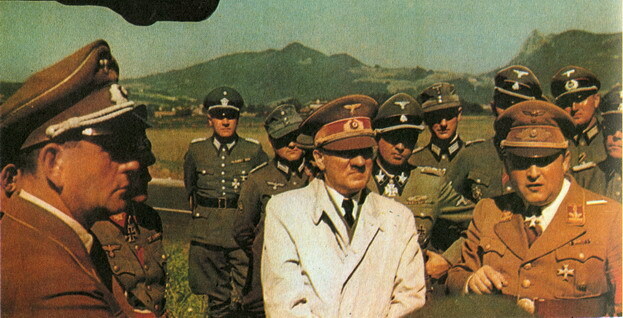 Griep Hans - SS - Oberführer und Oberst der Schutzpolizei with Hitler. 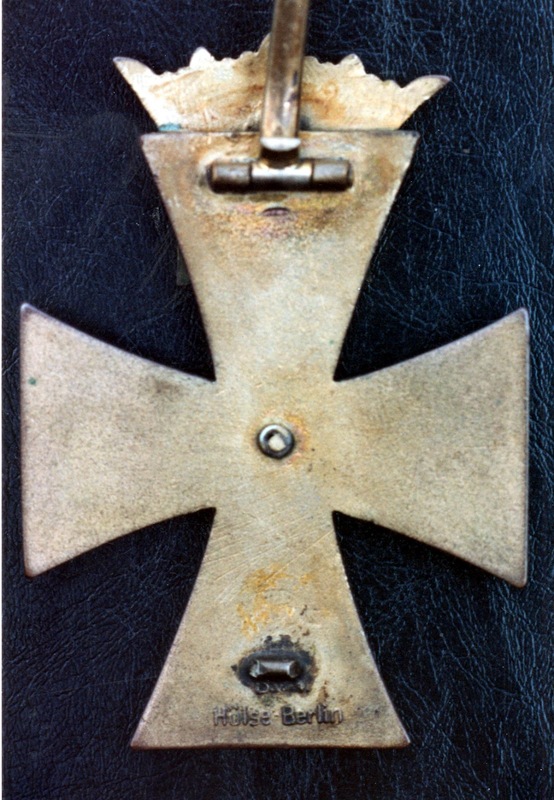 The Danzig Cross 1 st class can be seen on his left breast. A number of restrikes of the Danzig Cross First Class were produced in Germany during the early 1960's it is possible that there has been more resent strikes. 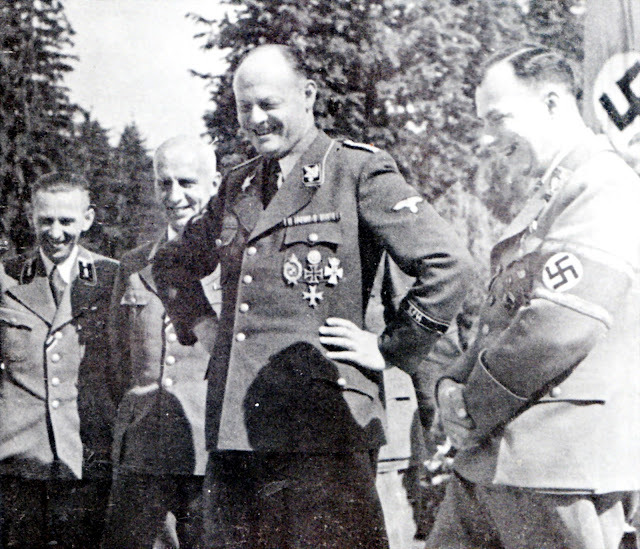 The award was not prohibeted by the German Federal Government due to the fact that it was Polish. Poland likewise did not perscribe it either. Thus the original maker could produce the piece if needed. 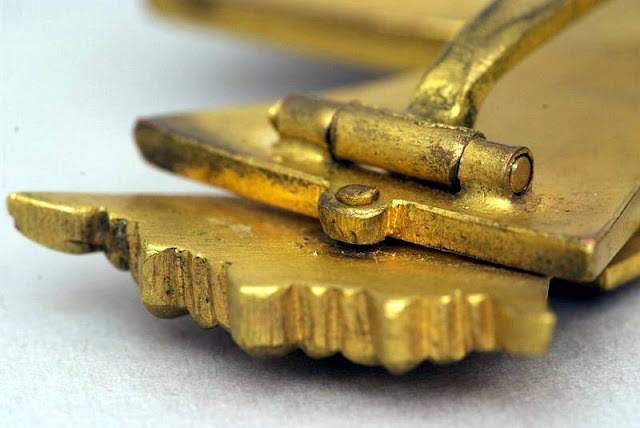 These have a plain, unmarked reverse and somewhat different pin and hinge construction to that described above easily identifies these. 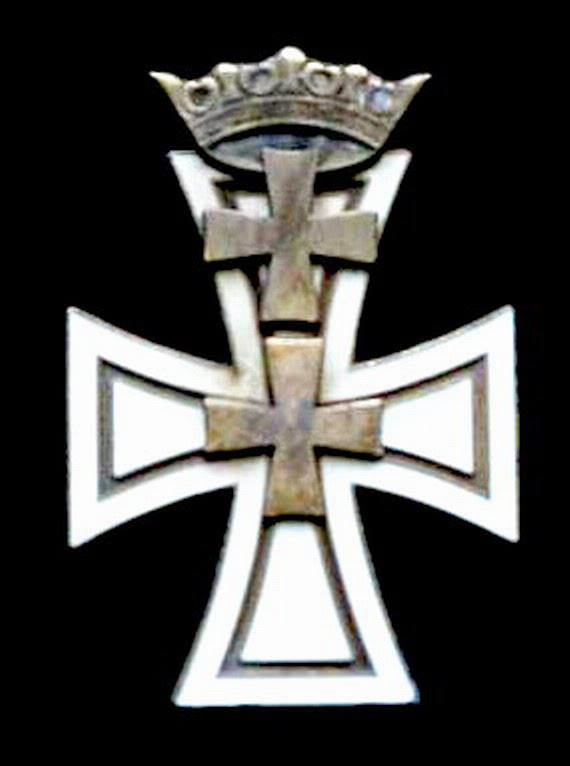 Recipients of the Danzig Cross First Class. CO of 323rd Police Battalion. Chief of the Office of Peoples Welfare. 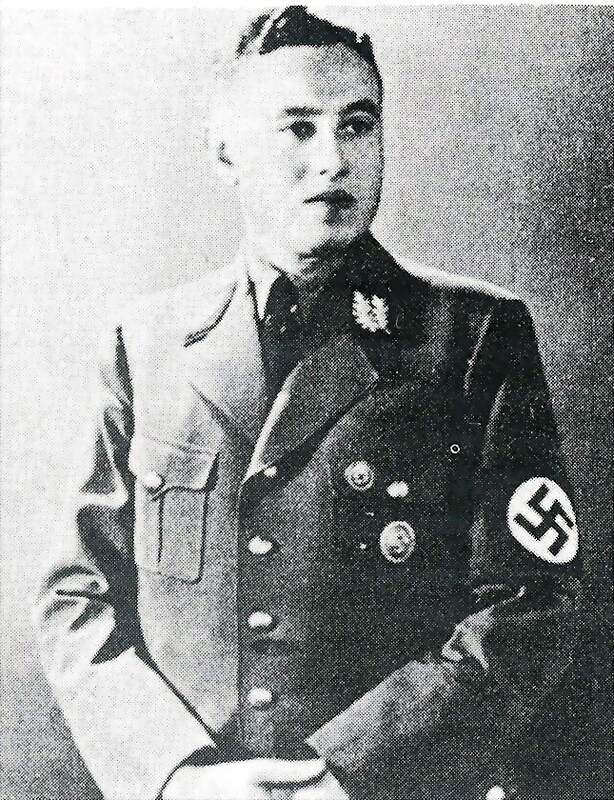 Ludolf von Alvensleben - SS-Standartenführer. 2 July 1897 - 1945 ? 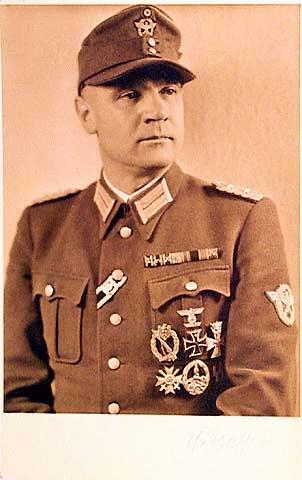 He was born in Heinitz and saw service in the First World War. Afterwards he became an economics statistician. 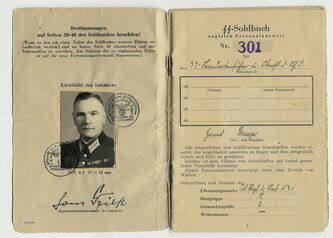 In 1929 he joined the NSDAP and subsequently headed the party-run annual winter relief programme and became chief of the office of peoples welfare and member of the Reichstag. This type is concidered to be the restrike. It is not to be graded as a fake. Danzig Cross 1st Class Fake. 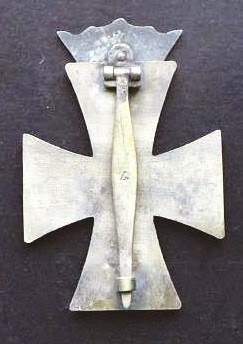 Danzig Cross 1st Class - Obverse Fake. 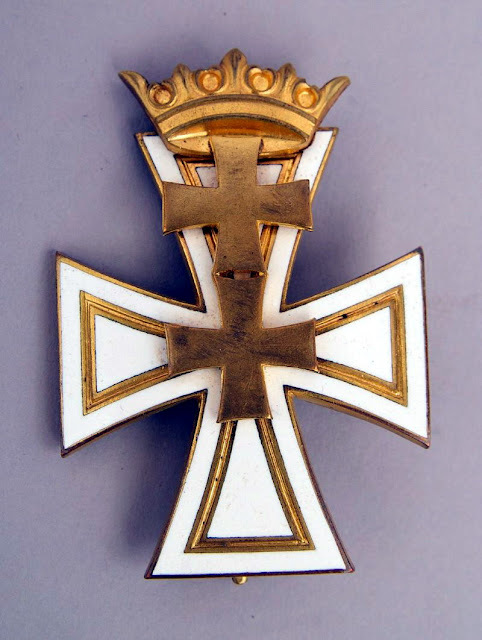 Danzig Cross 1st Class - Reverse Fake.